William Hughson Golding ran a printer’s supply company in Boston from 1869. Like J.F.W. Dorman (maker of the Baltimore 11), he soon graduated from making labels, rubber stamps, and seals to manufacturing printing presses for amateurs. His first of these was the Pearl, which was invented and patented by William Balch in 1871 and signed over to Golding. Over the next twenty years, Golding took out other patents in his own name, covering the Pearl and some of his larger presses. (See the Golding Jobber and Golding’s Official No.2.) 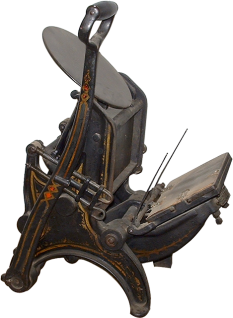 The Pearl remains today one of the most popular presses for amateur letterpress printing, due in part to its speed and attractiveness. It was made in two versions, the Oldstyle (pictured) and the heavier Pearl Improved model. (Smaller and larger sizes of each were manufactured as well.) This press has the serial number 1664 and is dated May 18, 1895. The Old Style Pearl No. 1 has been found with chase sizes of both 5″ x 7″ and 5″ x 8″. It was available in three different styles. The first was is as a tabletop version. It was also available with a flywheel and treadle, and the wood box it was shipped in was to be used for a base. Finally, it could be ordered with a flywheel and treadle with an iron base that had wooden drawers. It was eventually replaced with the Improved Pearl No. 8.